The Leader of the 2018 LJ Library of the Year. The 2017 LJ Librarian of the Year. Current and past PLA and CLA Presidents. Leading educators/influencers from California’s library schools. Numerous LJ Movers and Shakers. Directors of IMLS National Medal-winning libraries. Member of the California Library Services Board. Emerging young library leaders. 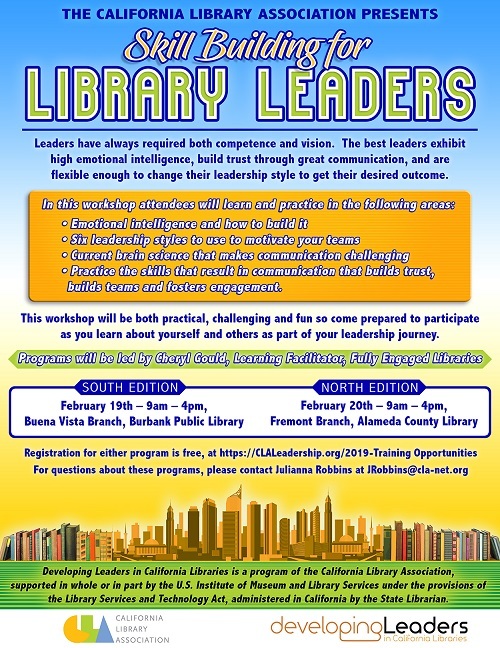 Come and hear a diverse group of library leaders talk about their leadership journey. Where they came from and how they got to where they are now. How they define “leadership”. Successes. Failures. What keeps them up at night. How they deal with politics on the job. How they have used mentors. And whatever you might want to ask them. No Power Points, just straight talk from some of the people who influence the California library community. Programs moderated by Robert Karatsu, DLCL Project Manager. These programs will be offered once in north and once in the south and open to all. Cheryl Gould, Learning Facilitator Fully Engaged Libraries. – Practice the skills that result in communication that builds trust, builds teams and fosters engagement. This workshop will be practical, challenging and fun so come prepared to participate as you learn about yourself and others as part of your leadership journey. Because of interactive nature, this session (offered in both north and south) will be limited to the DLCL cohort and approximated 15 other attendees. Luis Herrera, City Librarian (Retired), San Francisco Public Library, Dr. Camila Alire, Dean Emerita, University of New Mexico (and past ALA President), Patty Wong, Director, Santa Monica Public Library and Chantel Walker, Assistant Director, Marin County Free Library. Are you preparing for the future? 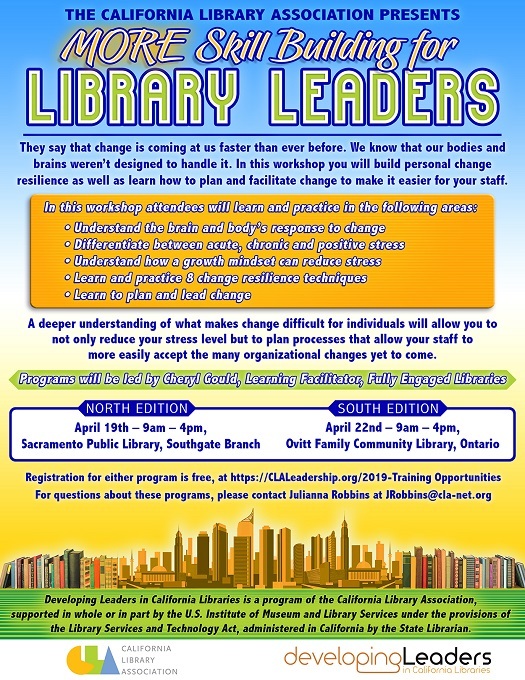 Do you want to prepare to lead change in libraries and/or in our profession? This program, initially offered as a pre-conference at the Joint Librarians of Color Conference has been expanded specifically for CLA and the DLCL program, is designed for library colleagues who are not only curious about how to prepare for an impactful career path but who are also ready to enhance leadership development skills. Topics covered range from understanding mindful leadership, developing best practices in leading change, team building, inclusive human resource practices, decision-making, risk-taking–building networks/social capital, mentoring, personal advocacy, and much more. Develop your career competitive edge at his preconference with four iconic, nationally-recognized library leaders. This program is free but to ensure a quality learning experience, registration will be limited to 60 participants maximum at each location. A deeper understanding of what makes change difficult for individuals will allow you to not only reduce your stress level but to plan processes that allow your staff to more easily accept the many organizational changes yet to come.